Think Branson when you're looking for the ultimate in relaxation, pampering, or simply a stress-relieving way to begin or end your busy day! Branson offers several spa experiences, including massage therapists and similar services at many of the area's finer lodging properties. Get Your Spa On -- Right at Your Branson Hotel! Chateau on the Lake Resort, Spa & Convention Center has a 14,000-square-foot, full service spa. Luxurious treatment rooms with hydraulic-operated massage tables are complemented by heated padding. There's a soothing infinity tub, an outdoor Roman bath beneath a waterfall, and several special services. The Chateau's Image Center offers beauty services including manicures/pedicures, paraffin treatments, and hair services. Therapeutic massage services and other body treatments like scrubs and detox wraps, as well as a variety of facials, are also available. Conveniently located on Branson's famous Strip - Highway 76 - the Clarion Hotel features a nice, hot Swedish sauna where you can steam your stress away, as well as a skilled massage therapist, and a convenient fitness room. The Radisson, a lovely high-rise hotel along Highway 76, features a nice hot tub, sauna, and a state-of-the-art fitness center. A Total Day Spa Experience at Branson's City Spatique! Even if your Branson hotel offers services, you'll definitely want to find a little pampering at a day spa! City Spatique is an exceptional, full-service day spa with a pleasant, relaxing atmosphere that offers a wide variety of stress-relieving, beauty enhancing, and health improvement services. Skilled massage therapists use Swedish techniques to lull you into a deep state of relaxation. It's a wonderful, drug-free, way to help heal sore joints and muscles. City Spatique offers several different facials... anti-aging, oxygen rejuvenating, simple, and a gentleman's facial. Other beauty and health services offered include anti-cellulite body wraps, waxing procedures, pedicures, manicures - including gel, and eyelash extensions. 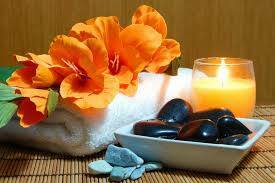 Massages available at City Spatique include: relaxation, couples, sports, lava rock, mom-to-be, chair, and hot shell. There's even a convenient gift shop stocked full of amazing products. If all you need is to relax is a tub full of bubbling hot water, a majority of lodging properties in Branson offer hot tubs in their swimming pool area or in their exercise facilities, and many have rooms and suites with jetted tubs.